Students at the #FundOurSchools Talent Show at the State House. 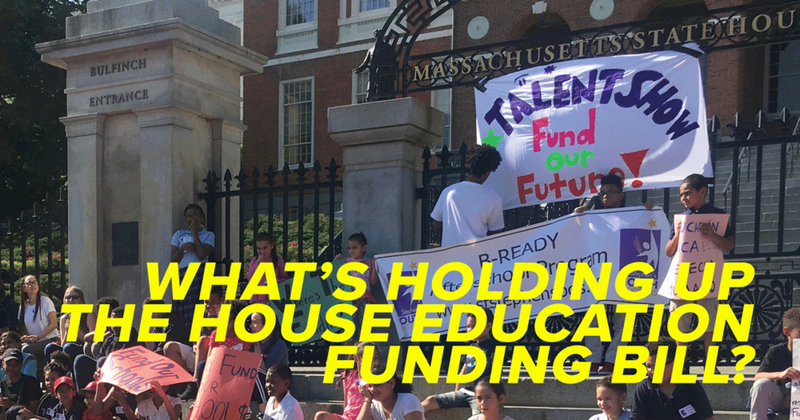 The Massachusetts Education Justice Alliance (MEJA) today called on the House Rules Committee and Speaker DeLeo to let House members vote on a bill that would update the state’s education aid program. The bill, S.2525, passed the Senate unanimously. To date, 87 of the House’s 160 members—a clear majority—have signed a letter circulated by Rep. Aaron Vega (D-Holyoke) calling for a vote. “We are gratified to see a clear majority of representatives commit to cherish public education and fund it for every student. The real question is: how much longer do children across Massachusetts have to wait before the state shows a real commitment to our schools?” asked MEJA Director Charlotte Kelly. The bill would implement the Foundation Budget Review Commission recommendations, which found that the state’s school aid formula underestimates special education and healthcare costs by over $1 billion. As a result, said Kelly, the school aid program, known as Chapter 70, fails in its objective of providing every child an adequate education. The program was first approved by the legislature in 1993 after a state Supreme Judicial Court ruling and has not been updated to match actual costs in 25 years. While the battle over school funding is fought in the State House, the victims are disproportionately children of color and children in low-income neighborhoods in Boston and across the state. One of those making calls to the legislature to urge their support for the bill is Rafaela Polanco, a parent at Boston’s Blackstone School and member of St. Stephen’s Church Youth Programs. This proposal is not a partisan issue. Senate Minority Leader Bruce Tarr, R-Gloucester, called the gap between rich and poor school districts “a moral failure of the Commonwealth,” according to a report in the Lowell Sun. But in the House, state representatives are still waiting for a chance to vote. MEJA is a grassroots coalition of students, parents, educators and community members who stand united in support of universal, free, and equitable public education for all students from Pre-K through college.